Apologies for the long absence! I’ve been working on our new Website and action initiatives. I’ll be back soon with some snark and circumstance. 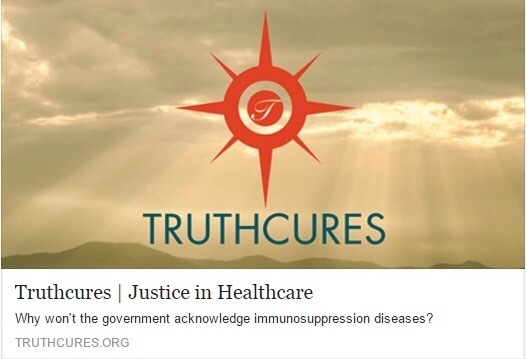 For now, check out TruthCures! You know why we petition You, You know how much we suffer and that we know if this is Your Will or Your Punishment, we accept it. Yet we speak this prayer out loud so the dark ones can hear us, and hear that we have no fear of their intents towards us and what role they played and still play in our injury and misery. We fear no evil. We have suffered what evil does. Evil has put us in cages, denied us our human dignity, broken our families, stolen our children, damaged our children’s brains and bodies, rendered us homeless and without friends and families, taken away our shelter, spoken rudely about us to all, everywhere. We know the tentacles of evil in the American government reaches beyond our borders. We know the American government has experimented with vaccines and even diseases on non-Americans. We’ve heard their excuses and their slander, which are nearly always told in the same phrases. ”There is no disease, there are only vaccines,” is what the CDC tell themselves. PREVENTION! and DISCOVERY! when how can the two be demanded at the same time, when the story of human illness and medicine is still being told? How can they CLAIM to have it all and know it all, and that which falls outside their current knowledge is fraud and a lie? Lord, You know what they do. And You know what we do, and how we suffer. We know some of us suffer because we deserve it. And some of us suffer undeservedly in Communion with the Suffering of Your Son, an innocent, a helper, one who cured the sick and only asked for Love in return. He only said, “I am the Way.” The Way is to Care. Was Your Son “Blessed” when He was tortured? Not in the way Americans think today with materialisms and comforts. Lord, you know why we beg for Your Intervention while accepting Your Will. In the present era, we can care for others mainly by trying to stop the harm that is done to them by the self-alleged medical profession. You said, “Blessed are they that hunger and thirst after justice: for they shall have their fill.” Well, we would like to cherry-pick that particular Beatitude, which speaks to mainly what will happen in Your Kingdom. We ask for Your Special Protection in pursuing protection for us all against the evil forces that would obstruct the agenda to free the sick-oppressed with this mission for Justice. You are the Light, so what will be, Is. No force is superior to the Truth. Thank you from Norfolk Island blessings of peace and good health to u always, please keep sharing. So nice to know you are not alone, thank you.